One of the greatest benefits of a holiday is the chance to leisurely eat a meal, especially if it happens to be in a place that has amazing views and, even better yet, is outdoors. However, it probably isn’t practical to plan to eat all your Byron Bay holiday meals out at lovely outdoor patio restaurants, so instead plan a picnic in an excellent natural setting to achieve this holiday perk. We’ve put together a list of eight picnic places to try out on your next (or first) Byron Bay holiday. But this list certainly isn’t complete; there are tons of places in the beautiful Byron Bay area to put down a blanket and have a picnic. So let this list be a starting point for the many picnics you will enjoy on Byron Bay holidays. 2) Who doesn’t want to have a picnic with a gorgeous beach in front of you? Plus, there are tons of places to pick up picnic food around Main Beach so you don’t even have to plan ahead much to take advantage of this holiday treat. And there’s one more bonus: A playground! So plan to bring the whole family to Apex Park and enjoy a fun, budget-friendly picnic in Byron Bay. If you’re visiting the beautiful Protestors Falls (and you should), then plan to bring along a picnic before you start the easy walk to the falls. The grassy Terania Creek picnic area is surrounded by the rainforest and was the location of the protests to save the rainforests of New South Wales from more logging—thus the name Protestors Falls. So nosh on delicious food and relate the historical significance of the area to your friends or family. Surrounded by a national park reserve, this beach is just steps away from Broken Head Holiday Park, and even though we might be a little biased, we think it’s an excellent location for a picnic. Not only is the beach perfect for a swim or surf, this spot in our picnic ideas list includes barbecue facilities so you can cook up a delicious meal for you and your mates. Plus the proximity to the Three Sisters walking track gives you an excellent way to either work up your appetite or work off those calories you just ingested. Not far from the iconic Cape Byron Lighthouse, Wategos Beach’s picturesque setting is yet another picnic spot that is a must on a Byron Bay holiday. Plan to take advantage of the protected beach and take a quick dip before your picnic. You might just catch a glimpse of a bottlenose dolphin! The barbecues are free to use so don’t just pick up deli food but rather bring along some ingredients to cook up so you can eat yummy, hot picnic food. Afterwards, you could visit the lighthouse—knocking off another Byron Bay top attraction—by way of steps (keep in mind these are rather steep) at the edge of the beach. Head to the hinterland to hit up this picnic spot, the Rocky Creek Dam is another great place for a family to visit. Not only are there barbecues for public use, but there’s also a playground for the kids to run around while you leisurely finish your picnic food. Another reason to visit this spot is the chance to see a platypus, goanna or cockatoo. Plus, there are four walks available from this location from an easy 20-minute walk, to a more than two-hour hike, all of which explore the surrounding rainforest. One of the most photographed beaches in Australia, Tallow Beach is a long, open beach, perfect for taking a nice beach walk where you’ll enjoy stunning views of the Byron Bay area. The perk of this location for a picnic is just off the beach is Gaggin Park, about halfway along Alcorn Street. The beachfront park not only provides a good access point for Tallow Beach, but it also has a great set up for families – picnic tables, BBQs and a playground (that even has shade!). While there aren’t a ton of places to grab food or beverages (although the popular Suffolk Bakery is just a short walk up Clifford Street), you simply need to plan ahead to bring your meal with you and then take advantage of the BBQs. Head to Brunswick Heads Nature Reserve to enjoy some excellent nature appreciation time — bird watching, fishing, walking, and, of course, a picnic. The picnic area is shaded and surrounded by cottonwood hibiscus (which blooms large yellow flowers during the warmer months) as well as marblewood and stinking laurel (don’t worry, they don’t actually smell!). While you’re eating, you might catch a glimpse of oystercatchers eating near the rocks near the river or see brahminy kites or white-bellied sea eagles overhead. Keep in mind if you’d like to fish while here that this reserve is part of the Cape Byron Marine Park, so you need to keep your fishing to the designated area. Before or after you eat, you might want to take a walk on the North Head walking trail, an easy hike that takes you through the coastal rainforest to the river. Located in nearby Mullumbimby (an excellent place to take a day trip for many reasons! ), Heritage Park offers a nice spot to stop and have a budget-friendly picnic meal. Great for both nature lovers and families, this park is home to the Bontanic Park where the Byron Flora, Fauna & Conservation Society planted and labelled more than 200 rainforest species. In addition, visitors will find an open, grassy area at the end of the walking trail with a small playground, swings and sand scooper adjacent to the covered picnic table. It’s worth noting this all located along the Brunswick River. With fairly warm temperatures all year round, a Byron Bay holiday means a chance to plan picnics for you and your family. 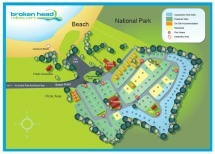 Stay with us at Broken Head Holiday Park, and you can even have a picnic at the park with our own barbecue facilities. So book your holiday soon, and you can follow this list or make one of your own!